Papdi is small round disc-shaped crisp and is one of the staple ingredients in the making of the famous street foods like papdi chaat, sev puri, etc. Typically, they are made with maida. But, I have been experimenting with a whole wheat version lately with reasonably good results. 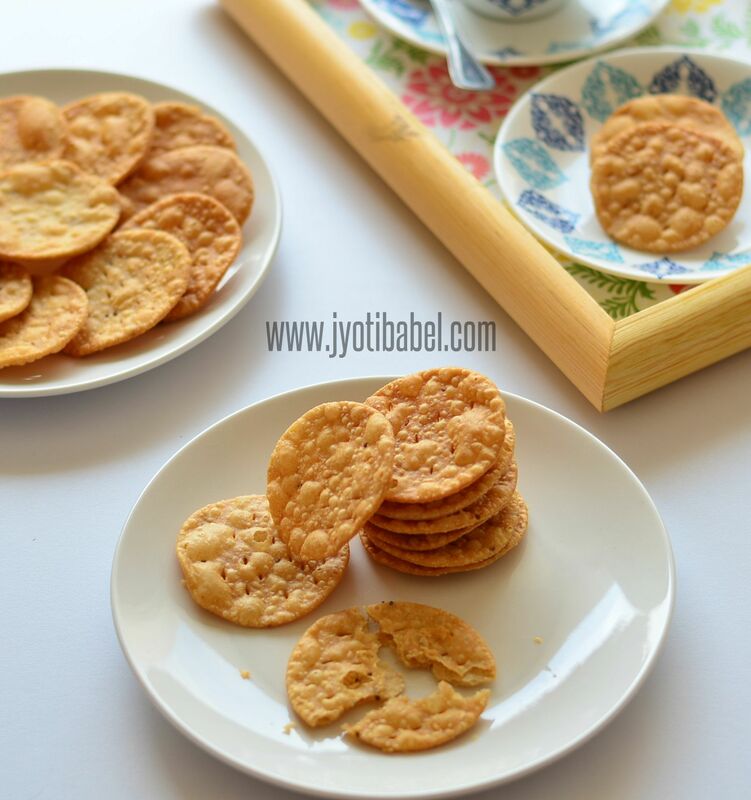 The recipe for whole wheat papdi I am sharing today are 100% maida or refined flour free. I had made these for Holi this year and used them in making papdi chaat. 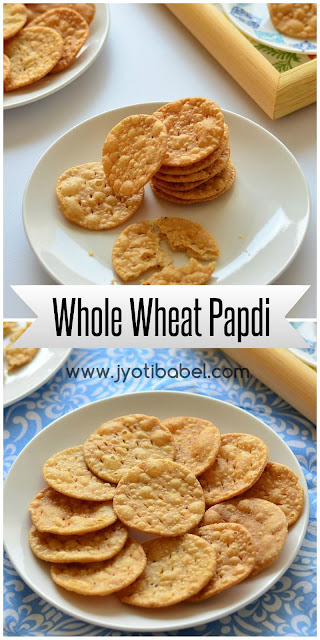 When stored properly in an airtight container, these whole wheat papdi can easily last for 3-4 weeks. Store bought papdi often have a rancid oil smell. So, whenever possible I prefer to make these at home. This way can control the quality of flour and oil used in making these whole wheat papdi. Next time, I am thinking of trying a baked version of this. 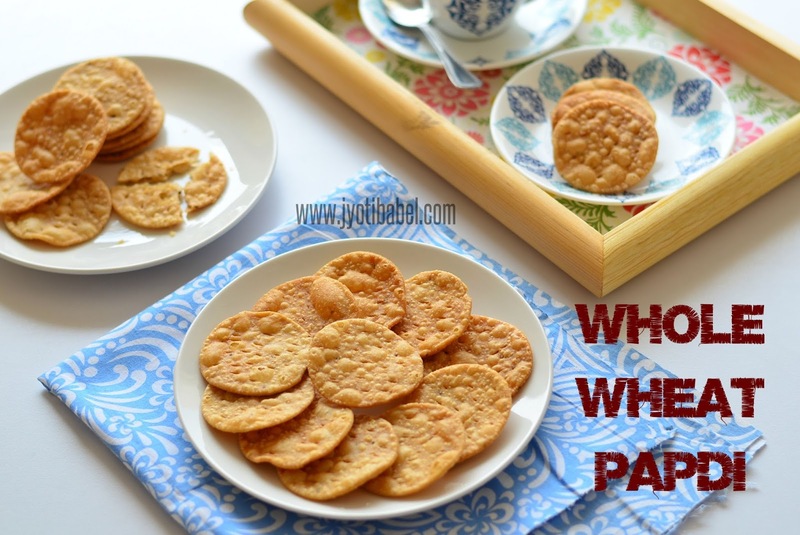 Let's check out the recipe for Whole Wheat Papdi now. 1. Mix the whole wheat flour (atta), ajwain, salt, oil in a large mixing bowl. 2. Use water little by little and using your fingertips work on the flour. The flout will resemble like crumbs at first. Add water as needed and knead a firm dough. Sprinkle a little oil over the dough and keep it covered for about half an hour. 3. Take the dough again and knead it again. Divide it into 4 equal balls. Roll one dough ball at a time into a thin round shape. Using a round cookie cutter cut out round dough shapes of the rolled dough. Prick it with a fork so that they don’t puff up while frying. Remove the extra dough pieces and add them to other dough balls. 4. Heat oil in a kadai and fry the papdi on medium to high heat till they are nice golden in colour. Drain the papdi on paper napkins so that excess oil is removed. 5. Likewise, use the rest of the dough balls to make papdi. When the fried papdi have cooked completely, store them in an airtight container. 6. You can use these papdi in a number of dishes like papdi chaat, sev puri, bhel puri or can consume them as it is with hot masala chai. 1. Using semolina/suji gives it a crunchy texture which we like. You can also make these papdis without semolina also. 2. Whole wheat flour soaks more water. So to knead the dough of these papdi you will need more water than what is needed for maida dough. You can also check out my Oats Mathri and Nimki recipe. These savoury papdi are my entry for BM#86 Week 2 Day #2 under the theme - 'Festivals/ Occasions'. For Day #1 I had shared this Kesar Phirni Recipe. With some nice pickle . These papadis have turned out perfect , and look nice and crunchy . Papdi has come out very good. Though it is used in chaat, once can much on these as it is. Papdi with wheat flour has turned out perfect. Homemade goodies are always the best.. The papdis have turned out so good..I love these in the chats..very good ones..
home made papdi that too with whole wheat is a great idea. Surely they are great in taste. Looks so crispy and crunchy. I can imagine papdi chat with these. Omg, i dont mind munching those super crispy wheat papdis, lovely Jyoti, they are just prefect and more tempting. Pass me those papadi and I would happily make a papdi chaat and finish it soon. What a crispy and addictive snack that is. Love your use of wholewheat flour instead of all purpose flour. That's the problem with the store bought ones naa... the rancid oil smell. Nothing can beat homemade ones. Great share Jyoti that too with whole wheat its awesome. perfect color and texture! such an addictive snack! i would eat them up as such!!!! These papdis have turned out so crunchy and tasty! I could have them all just like that!